Football Manager 2019 is beloved for its closeness to reality and depth. But what if you can enhance the realism even more? Thanks to FMGreece we’re proud to present the Nik33’s Transfer and Data updates which makes subtle but important changes to Football Manager 2019. The Football Manager 2019 Transfer & Data update by Nik33 is one of the most in-depth data packs within the Football Manager 2019 community. Experience 820 new real agents(! ), newly added wonderkids and other promising talents, new world media sources and other vital changes to update the current football season to its current date. 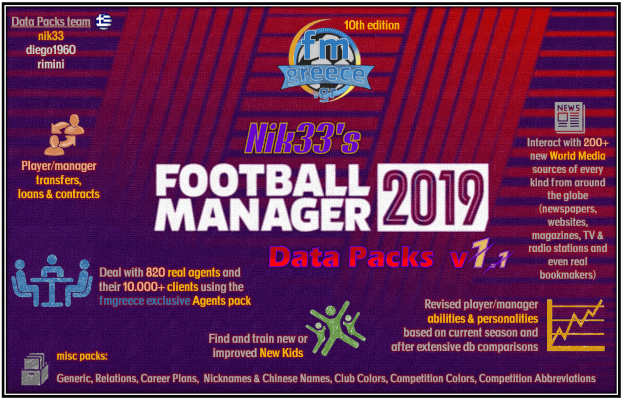 Download Nik33’s Football Manager 2019 transfer & data update megapack below and update FM19 with the latest changes to player and manager movements, contract extensions and terminations plus updated player information, abilities and personalities. Nik33’s Transfer and data update packs features a number of editor data files which makes important changes to Football Manager 2019. Here you can get a detailed overview of what the megapack features. What’s excellent, is that the files will be updated for your convenience throughout the season to add more realism and more depth. This file adds the latest transfers and loans happened after the release of Football Manager 2019. It updates the game with contract extensions and player and manager movements around the globe. The transfer and contracts pack is due to see massive updates for the next transfer windows. Updates player / manager / backroom staff abilities and personalities according to the current season and after extensive comparison between other players and staff. Included is an exclusive pack of nearly 800 real agents with their clients. The agent pack let you experience Mino Raiola, Jim Solbakken, Jorge Messi and other real football agents in the world. All current clients are added to the clients in additional to the different traits of the agents. Alongside the agents pack comes a real media pack featuring more than 200 media sources from around the world. It includes newspapers, magazines, websites, TV and radio stations of international and national reputation. Included are also some real bookmakers. Experience FourFourTwo attending your next press conference or Sky Sports asking you those tricky questions or have an interview with Barça TV after taking charge of Barcelona FC. As a great extension to our FM19 Wonderkids shortlist comes an update featuring new promising talents and future wonderkids. We won’t reveal which young talents that has been added since this is for you to discover. Career Plans Pack which adds career plans to players and staff according to real life choices, interviews and social media posts. Competition Abbreviations Pack updates competition names to match their licensed names. This file is not needed to select if you are using our real names fix or other files from external resources that adds sponsorship names. Competition Colors Pack which fixes and adds real competition colors of international tournaments and leagues, such as the brand colors of Champions League and Europa League. Nicknames Pack updates the short name of a number of teams as well as adding their nicknames. It even updates the names of Chinese club names. Relationship Packs adds new relationships to players and staff according to interviews, social media posts and other incidents happened so far this season. Plus Much More…that will be added and included as the season progresses! A megapack of data updates that adds the latest football transfers, real agents and media sources, fixes competition names and colors, updates player and staff abilities in additional to other information to make Football Manager 2019 more accurate to this season events. Download the data pack above. A huge thanks to Nik33 of FMGreece.gr for allowing us to distribute this excellent piece of work to our Football Manager community. Thanks to everyone else involved, especially diego1960 and rimini, for adding depth and realism to this excellent megapack of transfers and data updates. The original version of this download can be found on FMGreece.gr by using this link.